Fleas treatments can be an essential part of the health-care regime of our pets because these pests cause such discomfort and are so common. There are lots of different collars and solutions out there that claim to be the ultimate approach, but the seresto flea and tick collar seems to be pushing the boundaries in terms of its targets, features and lifespan. This analysis will take a closer look at the purpose of this collar before weighing up the different pros and cons from user-based seresto flea collar reviews. What is the seresto flea and tick collar and what is its purpose? Simply put, this is a flea collar that aims to provide longer lasting relief against both fleas and ticks. There is also the potential to repel other pest like mange, but the focus tends to be on the dog fleas and ticks. This tick and flea solution is designed to prevent reinfestations in addition to killing the animals already in the coat. At its best, this collar should last for 8 months and provide a safe, simple alternative to messier, short-lived treatment options. The company claim that it provides the “same performance as a topical with the non-greasy convenience of an easy-to-use collar” When we compare user reviews and comments on the different features it seems that there is some great potential here, even if there is some difference of opinion. Advantages of seresto flea collars. The main selling point of this product is that this is a veterinarian-recommended collar for both fleas and ticks that has the potential to last for 8 months. This is down to the use of sustained release technology that gradually releases the chemicals over a longer period of time. There are some great reports of dogs quickly becoming flea and tick free and some say that the bugs don’t come back for 6 months, maybe longer. There is the warning that the durability decreases with frequent swimming, taking the lifespan down to 5 months. It is clearly not entirely waterproof although it is said to be water resistant. There are also a number of user-friendly features with both the dog and owner in mind. An important convenience here is the fact that this non-greasy collar replaces the unpleasant topical solutions that some owners use. Not only does this mean that you don’t have to use these liquids once a month and get messy, you could be saving money by paying out for one treatment option every 6 months. There is the added benefit here that the collar is also said to be odorless. Another interesting dog-friendly feature is the use of the quick release mechanism. This catch is released by the pressure of the dog’s own weight if it becomes trapped somehow and needs to struggle free. This is an unlikely scenario, but it does provide some extra peace of mind for owners. Unfortunately, not all users are seeing these great results and there are some disadvantages to this approach. Results will always vary from pet to pet because of different skin conditions, the prevalence of fleas and ticks and the exposure to sunlight and water. There are plenty of 5 star seresto flea and tick collar reviews talking about miraculous results, but there are also reports of inadequate results. Some buyers say that is needs some time to build up in the animals fur or simply to start to work in order to repeal the ticks properly. In some cases, there are ticks under the collar weeks later. There are also going to be reports of collars failing completely so great results are not guaranteed. Some users criticize the poor packaging here, saying that it doesn’t indicate time spans or typical expectations. It is also important to note that there are complaints about bad reactions to the chemicals used and the quality of the materials. Some say that the collar comes undone too easily and that the catches are not good enough. As for the chemicals, people are warned not to sleep near pets with these collars on (just in case) and there are some pictures of cats with sores. The pros and cons of the seresto flea and tick collar. Let’s take another look at the pros and cons of this collar to weigh up the good and bad points and see if this collar really is recommendable. The collar is highly recommended by vets and many other pet owners seresto flea and tick collar reviews. The collar has a number of user-friendly features like the easy application and lack of odor. The collar is a convenient alternative to topical treatments. The collar has a quick release mechanism in case or emergencies. The collar has the potential to last for up to 6-8 months, which could save you money. The collar can take a little time before results are noticeable. The collar can come apart a bit too easily, which leads to security issues. The collar could cause adverse reactions in some pets. The collar becomes less effective if it is submerged in water too often. The final verdict of this seresto flea collar review. The problems that have been experienced with this collar show that this is not the perfect solution for all pets. Some animals will see no ill-effect and the fleas and ticks will be repelled for close to full 8 months. Others could struggle to see results after a month or have reactions to the chemicals. With a stronger clip and clearer instructions on the packaging, owners could forgive this hit-and-miss approach a little easier. 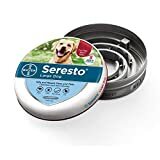 Despite all of this, the seresto flea and tick collar is still highly recommendable as long as you keep an eye on the heath of your pet and the results and remain patient. The convenience and potency of the collar means that there is still plenty of potential and it could make a big different to the health of your dog and your wallet. Video: Seresto flea collar - how does it work?